Due to the longer than expected lockout, the National Hockey League announced Friday that the 2013 Winter Classic game has been cancelled. 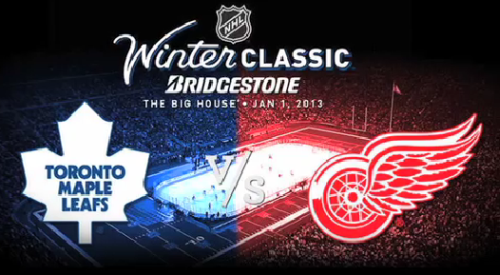 The game was supposed to be between Original Six rivals Toronto Maple Leafs against the home team Detroit Red Wings on New Years Day (January 1, 2013). The game was set to make the most revenue of all the other Winter Classics that were hosted in Buffalo (2008), Chicago (2009), Boston (2010), Pittsburgh (2011) and Philadelphia (2012) because of the amount of people the “Big House” could hold. The University of Michigan football stadium holds an official capacity 109,901, but can fit 114,000 if necessary. 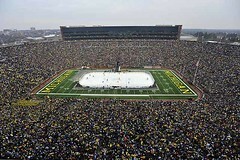 In 2010, the stadium held 104,173 people for the “Big Chill” game between the University of Michigan hockey team against the University of Wisconsin hockey program. That number can only go up with the millions of Maple Leafs and Red Wings fans there are across North America. Year after year, the NHL makes a lot of money–and gets a lot of attention–from the Winter Classic, no matter what city is located in. Not to mention, the amount of attention HBO gives the NHL by doing the “24/7: Road to the Winter Classic” series. Friday’s cancellation of the Winter Classic wipes off 327 regular season games. The Winter Classic is hands down the biggest regular season event in the NHL. Many casual hockey fans will turn away from the game because the “big event” will not be happening on New Year’s Day. The owners and the Union officials have failed the fans in bringing a season this year. There is little doubt in my mind, that because of the lack of urgency in getting together to work out a new Collective Bargaining Agreement, the 2012-13 season will not commence. It is really sad, but there has to be a sense of urgency between these groups. Since Friday, November 2, it has been fifteen days since both sides have came together to talk face-to-face. That may be true, but your offers to the NHL and its owners haven’t been perfect. As the numbers came out on the “50/50” proposal offered by the Union, they played the fans as fools in telling them it was even. The numbers said that it was 57 percent in favor of the Union. Also, in the five year deal, it would never reach the even 50/50 of HRR. To end on a positive note for the city of Ann Arbor and Detroit Red Wings and Toronto Maple Leafs’ fans, the NHL will have the 2014 Winter Classic at Michigan Stadium.